Miles Davis, Ornette Coleman, and Cecil Taylor revolutionized music from the end of the twentieth century into the twenty-first, expanding on jazz traditions with distinctly new concepts of composition, improvisation, instrumentation, and performance. They remain figures of controversy due to their border-crossing processes. 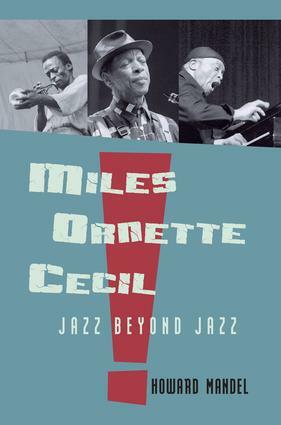 Miles, Ornette, Cecil is the first book to connect these three icons of the avant-garde, examining why they are lionized by some critics and reviled by others, while influencing musicians across such divides as genre, geography, and racial and ethnic backgrounds. Mandel offers fresh insights into their careers from interviews with all three artists and many of their significant collaborators, as well as a thorough overview of earlier interpretations of their work. Howard Mandel is an award-winning journalist who has published articles in Down Beat, The Village Voice, and The Wire, among many other publications internationally. A longtime arts-segment producer for National Public Radio and adjunct associate professor at New York University, he is also the president of the Jazz Journalists Association and the author of Future Jazz, published by Oxford University Press. Further details on Mandel and his work are available at www.HowardMandel.com.